Kia Horton is a married mother to two children, ages 2 and 6. I have a very challenging and demanding career. This background information provides a little insight into what could be considered the chaos of my everyday life. It is challenging, yet can also be rewarding. It also doesn’t leave very much time for incorporating a healthy lifestyle that for 37 years, I did not employ. Change is definitely, in my opinion, one of the hardest thing for any person to accept because I believe you have to rediscover who you are! That is where my journey began! I have been overweight all of my adult life. I started to gain weight as a pre-teen, around the age of 12. While in high school, my dad allowed me to sign up for NutriSystem. I was able to lose approximately 30 pounds, which put my weight at 168 pounds. I hated the food and the program was not sustainable because eating their food was the only key to success. Standing only 5″4″ tall, by the time I entered college, I weighed a whopping 210 lbs. The weight continued to snowball from there. When I returned home from college I weighed 260 lbs. I immediately joined a gym and hired a personal trainer. This also proved to be futile because I was not ready to change my eating habits. I loss no weight during this time. I quit! 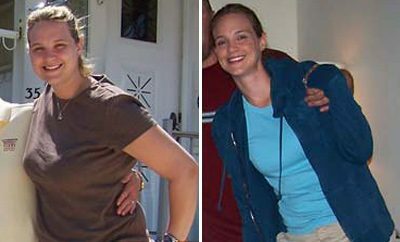 Through the years, I tried and failed many times at all kinds of weight loss plans. Mostly crash dieting and extreme food depravation. I would lose weight for the short term, at times as much as 40 pounds, but I would shortly gain it all back plus a little more. I haven’t yet shared this part of my story with everyone because it is deeply personal, but I wanted to be totally honest. By the age of 31 I was completely fed up with myself topping out at 319 pounds. This prompted my decision to go under the knife and have lap-band surgery. This has proven to be one of the worse decisions that I have ever made. Although this surgery probably assisted in me being able to get pregnant. Prior to the surgery I did not have a consistent menstrual cycle for years. My doctor often told me that this was a side affect of being morbidly obese. After the surgery I immediately dropped 50 lbs and within a month I found out I was pregnant with my first born. I was over the moon with excitement and did not care that I had just invested a ton of money into the surgery. Within another 18 months I was pregnant again, but this time I wasn’t so lucky. I loss the son that I had prayed for after 5 months of pregnancy. This sent me into a tail spin. I had no outlet for stress. Eating was what provided comfort in any uncomfortable situation. I quickly started to put the pounds back on. By the grace of God, I was pregnant again within a year with another son who is now two years old. I never once had the lap band adjusted. I believe that even if I did adjust the band, it would not have sustained weight loss because I was not ready to change my mind about food. During my second pregnancy I developed hypertension. I couldn’t believe that this was happening to me at the age of 36, but I accepted it as my fate. I thought that I was just an overweight woman. I spent many years convincing myself that I had achieve the American dream because I had a husband, two children, four fish and two birds. What more did I need? I was worried about the life threatening effects of hypertension, but not enough to change my lifestyle. On a random night out with my girlfriends, i was chatting with a stranger who happened to be really into fitness. 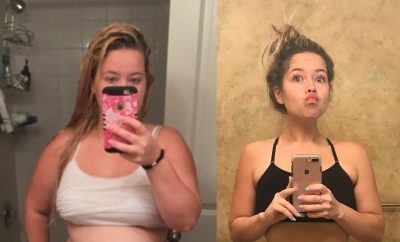 We started to chat about my fitness journey and I have to admit I was pretty defeated. He encourage me to give it one more try, if not for myself, then for my children. 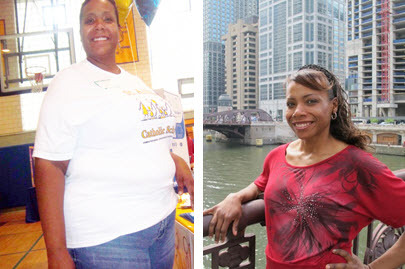 The following Tuesday, January 17, 2012 I walked into Weight Watchers with a friend weighing in at 299.4 pounds. I initially only wanted to join for one month to see what it was all about, but after the first meeting I was hooked. I signed up to do it all. I wanted to work the plan to the fullest to see if I could do it. After the first week I was down 4 pound. The second week, I was down another 4 pounds. I thought that this was impossible. This continued for about a month and then the weight loss started to slow to about a pound per week. I realized then that I need to incorporate exercise into my plan. I have never been very patient, so I knew in order to stick with this I was going to need to see results… FAST!! I started doing Zumba on my WII 5 or 6 days a week with my husband and children. I followed this routine for months, barely missing a day. When the weather started to get warm, i signed up to start walking 5K’s. This changed my life. I started walking along the Chicago lakefront everyday 3 – 4.5 miles. By the end of July I was able to run the entire path, albeit slow, but I still did it. This started my “like” for running (I’m still not in love). Running for me is the time that I have quiet space, with just my thoughts and my breathing. I often cry when I run, but it’s a good cry, a release of emotion. I have found out from talking to other runners that this is a common phenomenon. Running allows me to be FREE of stress! In September, it started to get cold and I started running on a treadmill! Boring! Yet again I had to be flexible if I wanted to stay on the path to weight loss. I was already down nearly 100 lbs, I couldn’t quit now. I joined a bootcamp with a friend. This is where I developed a love for circuit training. In October, I was referred to Andrea Nichols-Everett, who own D3: Dre’s Diesel Dome. I initially started doing the bootcamp only two days a week and I would run the other three days. After two months I was hooked and changed my program to Monday – Friday, while still running three days a week. Today I weighed in at 144 pounds at Weight Watchers. That puts my official weight loss at 155.4 pounds. Slowly, but surely changing my mind about who I am has led me to change how I think about what I eat! I’m so proud of you! You look great! Keep up the good job! ★ TRIPLE STENGTH FROM ECOLINE ! Pure 2000 mg molecularly distilled omega 3 fish oil pills with 1,400 mg omega-3 fatty acids (800 mg EPA, 600 mg DHA) a serving (4 – 5 times the amount found in other fish oil supplements). Best value 120 softgels for full 2-month supply. ★IMPROVE YOUR HEALTH WITH FATTY ACIDS ! Omega 3 supports: mood, brain power, dry eye, heart health, and joint relief. A perfect dietary compliment for: weight loss, bodybuilding, reducing inflammation, a slim waist, and optimum nutrition. ★BETTER ABSORPTION & PREVENTION OF FISHY AFTERTASTE ! Our omega 3 fish oil pills have an enteric coating to help increase your absorption of the essential fatty acids and to help reduce fishy aftertaste. Enjoy Health Benefits Without Fish Burps! ★PURITY THROUGH MOLECULAR DISTILLATION ! EcoLine fish oil met or exceeded all LabDoor purity and label accuracy standards. Our fish oil is purified with molecular distillation – one of the few current methods that can remove heavy metals, PCB’s and other toxins to below detectable limits for human consumption. Natural is the best way..
Congratulations! Now comes the really hard part – maintenance. Hard but attainable. You look fabulous. The healthier version of you looks years younger. Way to go!!!! The worst part. Lost over 100 lbs 5 times. This is my last time. Amazing determination and hardwork, atta girl Kia!!!! Girl, I appreciate you 🙂 You keep me going….I’ve had enough too, and have since lost 40 pounds. I’ve got a long ways to go, but when I read story’s like yours….you keep me inspired to keep going 🙂 Thank you!